The 2013 year was another busy and productive year for NASA and the world’s space agencies. 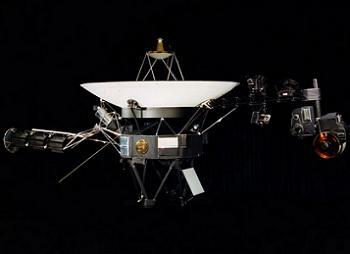 As with 2012, robotic exploration of the solar system and, for the first time in human history, interstellar space, dominated space exploration endeavors in 2013, with MESSENGER, the Van Allen Probes, Juno, New Horizons, and Voyager 1 all delivering above and beyond their promised mission objectives. 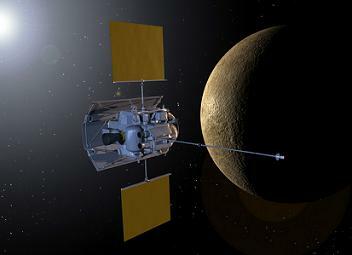 MESSENGER (MErcury Surface, Space ENvironment, GEochemistry, and Ranging): After two years, it is now a probe that waits. After arriving at Mercury in March 2011, MESSENGER conducted a full Earth-year mission that lasted until March 2012, after which it received approval and funding for a one-year mission extension. Officially, that extended mission began on 18 March 2012 and lasted until 17 March 2013. 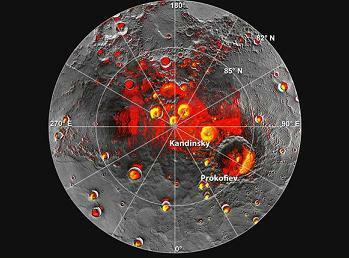 During the course of the year-long mission extension, MESSENGER continued several of the scientific observations it had been tasked with during the previous year, allowing scientists to, among other things, confirm the presence of water ice in Mercury’s polar region. Specifically to 2013, MESSENGER’s major accomplishment was the completion of the first-ever 100% map of Mercury’s surface – a task completed on 6 March 2013, just 11 days before the end of the its first Earth year-long mission extension. 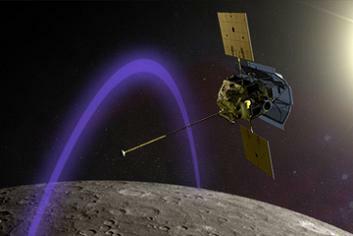 On 17 March 2013, MESSENGER completed its first mission extension. Since then, the probe and NASA have waited for formal approval and funding for a second year-long mission extension. If approved by NASA, a second extended mission would seek answers to still further questions that have yet to be answered by MESSENGER during its two Earth years in orbit of Mercury. The objectives of the proposed second extended mission would seek to further the findings from the primary mission and first extended mission. These objectives include attempting to answer the questions: What active and recent processes have affected Mercury’s surface? How has the state of stress in Mercury’s crust evolved over time? How have compositions of volcanic materials on Mercury varied with time? What are the characteristics of volatile sequestration in Mercury’s north polar region? What are the consequences of precipitating ions and energetic electrons at Mercury? How do Mercury’s exosphere and magnetosphere respond to extreme solar wind conditions near and following solar maximum? What novel insights into Mercury’s thermal and crustal evolution can be obtained from high-resolution measurements made at low altitudes? “We have a healthy spacecraft in orbit around a planet that will not be visited by spacecraft again for more than 10 years,” stated MESSENGER Principal Investigator Sean Solomon of Columbia University’s Lamont-Doherty Earth Observatory. To date, a second mission extension has not received formal approval or funding. Nonetheless, MESSENGER itself is in excellent health as it continues to orbit the closest planet to our home star. 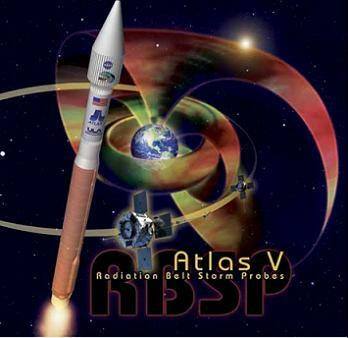 Launched in August 2012, NASA’s Radiation Belt Storm Probes, quickly renamed the Van Allen Probes after the man who discovered the Van Allen Radiation Belt that surrounds Earth, returned a remarkable discovery in February 2013: a previously unknown third radiation belt surrounding Earth. The Van Allen radiation belts were one of the first discoveries of the Space Age in the late 1950s. Observations since then have shown two distinct regions of trapped radiation surrounding Earth, known as the inner and outer radiation belts. 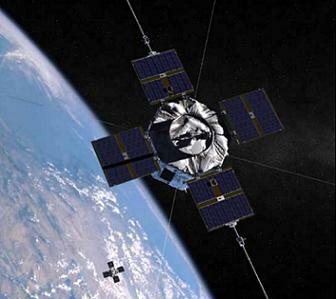 However, the Relativistic Electron Proton Telescope (REPT) instrument (particle sensors) aboard the twin Van Allen Probes quickly revealed the existence of a transient, third radiation belt. This third belt was observed for four weeks before a powerful interplanetary shock wave from the sun annihilated it. “Even 55 years after their discovery, the Van Allen belts are still capable of surprising us. 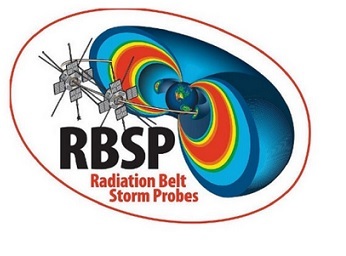 We thought we knew the radiation belts, but we don’t,” stated Nicky Fox, Van Allen Probes deputy project scientist at the Johns Hopkins University Applied Physics Laboratory in Laurel, Maryland. When they were first discovered in the 1950s, the radiation belts had little effect on ordinary life. However, they are now extremely important to humanity’s high-tech society. Numerous satellites, including weather prediction, GPS, and television satellites, routinely encounter the belts (which exists between 1,000 to 60,000 kilometers above Earth’s surface) on a daily basis. During these encounters, the satellites are subjected to the energetic particles of the belts that can damage solar panels and short-circuit sensitive electronics. Moreover, during geomagnetic storms, when the belts are swollen by solar activity, whole fleets of satellites can find themselves encompassed by the belts, creating potential disturbances of the technological underpinnings of daily life on Earth. It is these issues that the Van Allen Probes were designed to directly address. To this end, each of the twin Van Allen Probes carry an identical set of five instrument suites that allow scientists to gather data on the belts in unprecedented detail. 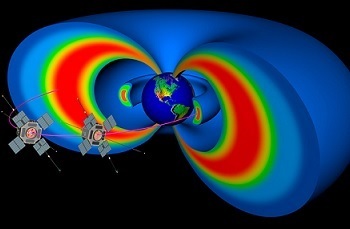 “The fantastic new capabilities and advances in technology in the Van Allen Probes allow scientists to see in unprecedented detail how the radiation belts are populated with charged particles, what causes them to change, and how they affect the upper reaches of Earth’s atmosphere,” says John Grunsfeld, NASA’s associate administrator for science in Washington DC. But the discovery and observation of the destruction of the third, transient radiation belt was not the only discovery the Van Allen Probes uncovered in 2013. By the end of December 2013, the probes had helped resolve decades of scientific uncertainty over the origin of ultra-relativistic electrons in Earth’s near space environment. Scientists have known for years that these kinds of electrons in the Earth’s outer radiation belt can exhibit pronounced increases in intensity in response to activity on the sun and changes in the solar wind. However, the dominant physical mechanisms responsible for such radiation belt electron acceleration have remained unresolved for decades. Now, the Van Allen Probes have helped narrow the mechanisms responsible to two probable candidates, one from outside the belts and one from within the belts. As reported by Van Allen project scientists, a theoretical process known as inward radial diffusive transport has been developed using data from the Van Allen Probes to explain the external mechanism. From within the belts, scientists hypothesize that the electrons are undergoing strong local acceleration from very low frequency plasma waves. Using data from the Van Allen probes, Richard Thorne and his colleagues observed high-energy electrons during the geomagnetic storm of 9 October 2012, which they analyzed together with a data-driven global wave model. The analysis revealed that linear, stochastic (a system whose state is non-deterministic) scattering by intense, natural very low-frequency radio waves – known as chorus waves – in Earth’s upper atmosphere can account for the observed relativistic electron build-up. 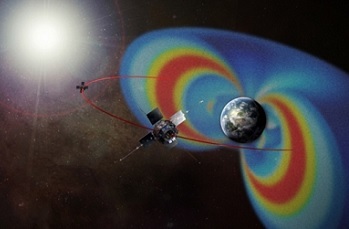 “The successful point-by-point comparison of radiation belt features observed by the Van Allen Probes with the predictions of the state-of-the-art model developed by Richard Thorne and his group dramatically demonstrates the significance of in situ particle acceleration within Earth’s radiation belts,” said David Sibeck, mission scientist for the Van Allen Probes at NASA’s Goddard Space Flight Center in Greenbelt, Maryland. Aside from Earth-local implications, this new understanding is likely to alter and expand our understanding of planetary magnetospheres throughout the universe because the local wave acceleration process is a universal physical process. Therefore, it should also be effective in the magnetospheres of Jupiter, Saturn, and other magnetized plasma environments in the cosmos. 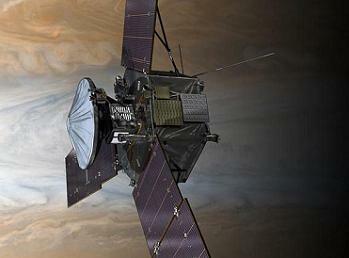 For the Juno spacecraft bound for Jupiter, 2013 was a relatively calm year. The first half of the year was spent in interplanetary cruise mode as the probe continued its multi-year journey through the inner solar system. On 12 August 2013 at 12:25 UTC, two years, seven days after its launch, Juno reached the first of two major milestones in 2013: the passage of the halfway point in its trip to Jupiter. At this time, Juno had officially traveled 9.464 astronomical units (AU), the exact halfway point in its 18.928 AU journey to Jupiter. When it reached the halfway mark in its journey, Juno was less than two months away from a close encounter with Earth for a gravity assist flyby that would send the probe on its final trajectory to the Jovian system. On 9 October 2013, Juno flew within 559 kilometers (347 miles) of Earth’s surface, thereby boosting its velocity by 16,330 mph or 7.3 kps. During the flyby, several of Juno’s science instruments made planned observations of Earth, which provided the opportunity to test the instruments during a close planetary encounter to ensure that they were working as designed. Shortly after the flyby was complete, Juno entered safe mode, a state designed to protect the spacecraft if its onboard computers detect unexpected conditions. During this particular safe mode, Juno turned off instruments and non-critical spacecraft components and pointed itself toward the sun to ensure that its solar arrays were receiving power. The cause of the safe mode was eventually traced to an incorrect setting for a fail protection trigger for the spacecraft’s battery. When Juno passed into Earth’s shadow during the 9 October flyby, the solar cells on Juno’s arrays were not generating electricity, which was expected as the spacecraft was shielded from the sun. However, Juno’s systems were still drawing on its battery supply. When the battery voltage dropped below the fail protection trigger, the spacecraft initiated the safe mode sequence to protect itself. By 12 October, the spacecraft had exited safe mode and was transitioning back into normal post-flyby operations. The following day, Juno entered safe mode again when the spacecraft’s onboard computer transitioned from the Earth flyby sequence to the cruise sequence of the mission. This time, when Juno’s onboard computer commanded the spacecraft’s systems into cruise mode, one of the instruments remained in Earth flyby configuration. When the spacecraft’s computer saw that the instrument was drawing electricity at a greater than expected rate for cruise mode, it did as it was programmed to do: initiate safe mode. 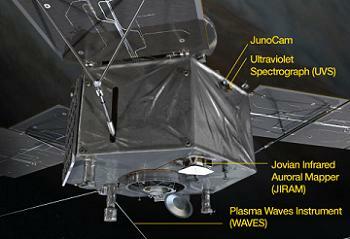 Juno exited this safe mode on 18 October and has since enjoyed smooth operations. With the successful flyby of the Earth for a gravity assist maneuver, Juno is on course for an arrival at Jupiter on 4 July 2016 at 22:29 EDT. As of 6 December, Juno was approximately 38 million miles from Earth traveling at a velocity of 32 kilometers per second (20 miles per second) relative to the sun. 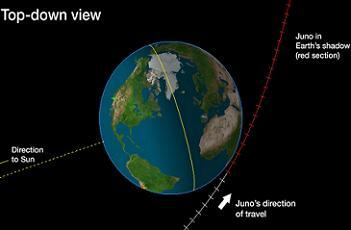 One-way radio signal travel time between Earth and Juno was approximately three and a half minutes. Since launch on 5 August 2011, Juno has traveled 1.8 billion kilometers (1.1 billion miles) or 11.9 AU and continues to operate in excellent health. Juno’s current trajectory is “near-perfect” vs. planned. 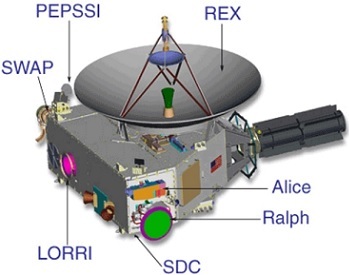 Like Juno, New Horizons had a relatively calm 2013. The spacecraft began the with a systems checkout after six months of cruising quietly through the outer solar system. During the January checkout, flight controllers on Earth awakened the spacecraft’s systems from hibernation for three weeks of activity that included system checks, a new flight software upload, and science data downloads. After a highly successful checkout, New Horizons was placed back into hibernation mode and allowed to continue quietly on its journey in the space between Uranus’s and Neptune’s orbits. By June, flight and mission scientists, using data from the Hubble Space Telescope and other observations of the Pluto-Charon system, agreed that the original flight path of New Horizons through the Pluto-Charon system would remain. 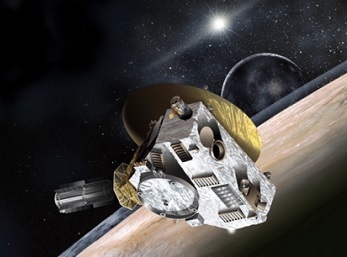 According to mission scientists, after an 18-month study of potential impact hazards – mostly dust created by objects hitting Pluto’s small satellites – the spacecraft would face as it speeds at 30,000 miles per hour (more than 48,000 kilometers per hour) past Pluto in July 2015, the team estimated that the probability of a mission-ending dust impact was less than 0.3 percent if the spacecraft followed the current baseline flight path, far below some early, more conservative estimates. Nevertheless, as NASA does, the alternative flight paths will continue to be worked and refined as New Horizons approaches Pluto should a hazard be identified in the intervening 1.5 years until New Horizons’ arrival at Pluto. Then, in July, New Horizons’ cameras were activated and aimed at its target destination. During this brief observational window, New Horizons return its first distinct images of both Pluto and its primary moon, or potential twin planet, Charon. 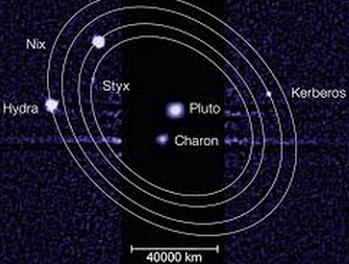 When New Horizons arrives at Pluto for closest approach on 14 July 2015, it will not only explore Pluto and its moons Charon, Nix, and Hydra, but also two newly named moons which were discovered in 2011 and 2012 via the Hubble Space Telescope. The newly discovered moons were officially named by the International Astronomical Union on 2 July 2013. The IAU chose the names Kerberos (whose precovery images date to 2006) and Styx. In keeping with planetary and moon naming structures, the IAU chose Kerberos, the Greek form of the Roman Cerberus, and Styx for their relation in Roman mythology to the god of the underworld Pluto. Naming of the two new moons received wide public attention due to an internet naming campaign by Mark Showalter and the SITE Institute on behalf of the discovery teams. The unbinding internet poll returned the following results: 1. Vulcan. 2. Cerberus. 3. Styx. The three names were submitted to the IAU for consideration, but the IAU immediately threw out Vulcan as a candidate name because it was not the name of an underworld deity and had already been used for a hypothetical planet inside the orbit of Mercury. 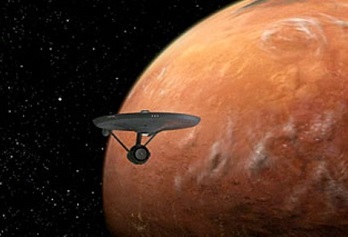 Despite protestations and claims made over the social media site Twitter, the IAU’s decision to remove Vulcan from consideration had nothing to do with its relation to the fictional alien race and planet in the Star Trek universe. The IAU also discarded the Roman Cerberus due to its current use as the name for an asteroid. However, the IAU approved of the Greek form of Cerberus, Kerberos. Styx received formal approval without any contest. For New Horizons, as of 25 December 2013 at 1700 UTC, the probe was 4.51 AU from the Pluto-Charon system. Radio signals for that day took 4hours 2minutes 23seconds to travel from the spacecraft to Earth, and 8hours 4minutess 46 seconds to travel round-trip. While those who follow their missions know the success of NASA’s fleet of solar system probes in great detail, it is often only a single space event that generates front-page headlines in a given year – if there even is a “front-page” headline event. And rarely is that event about an uncrewed probe. While Cassini’s photo of Earth was thought to have been that front-page story for 2013 in July, it was a September announcement that once again catapulted a long-since-launched probe to the fore of world news and solidified a new place for humanity in space exploration. On September 12, 2013, the hotly contested question of the last two years was finally answered: Voyager 1 was humanity’s first object to enter interstellar space. The historic announcement came from NASA after a year of review into 2012 and 2013 data points from the intrepid probe. 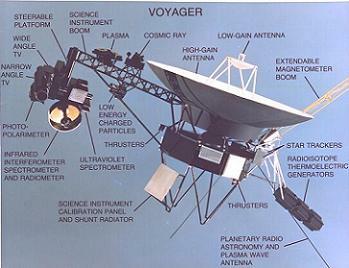 Officially, Voyager 1 entered interstellar space on 25 August 2012 – an event that wasn’t confirmed for over a year. Since mid-2012, scientists have questioned the analysis of data points returned from Voyager 1 as it passed through a new and unique region on the outskirts of the solar system. Specifically, the debate centered around the question of whether Voyager 1 was in a previously unknown region at the outer-most edge of the solar system (known as the heliopause) or whether Voyager 1 had actually crossed the barrier into interstellar space. On 25 August 2012, Voyager 1 registered an abrupt, durable change in the density of the energetic particles it was traveling through. 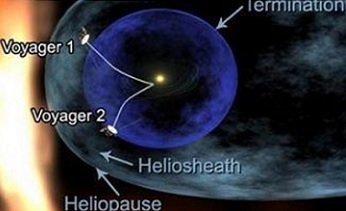 Initially, as reported by NASA in December 2012, it was determined that the August 2012 shift in particle density was the mark of Voyager 1’s full entrance into a new region of the heliopause, called the magnetic superhighway, at the outer-most edge of the solar system. It is now understood that this was a far more significant date and moment than first thought. In March 2012, five months before Voyager 1 would record the particle density change in August, a Coronal Mass Ejection (CME), a massive expulsion of charged particles, released from the sun. While seemingly routine at the time, the CME event could now be held as one of the most important and significant CMEs in recorded history. On 9 April 2013, 13 months after the CME event, (just over seven months after the August particle density change was recorded), the charged particles associated with the CME event reached Voyager 1 – which was at a distance of 17 hours 05 minutes 58 seconds light-travel time from Earth. When the CME charged particles reached Voyager 1, its Plasma Wave Instrument recorded the event and transmitted the data back to Earth. It is what scientists saw in these data points that was nothing short of stunning. When the CME particles reached the plasma cloud around Voyager 1, the plasma cloud began oscillating (vibrating) at a particular pitch that allowed scientists to determine the density of the plasma field surrounding the intrepid little probe. 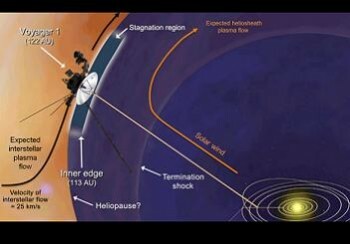 The results: the plasma was 40 times denser than what Voyager 1 reported when it was in the outer layer of the heliopause of the solar system. Moreover, the density matched all expectations of the plasma density of interstellar space. “We literally jumped out of our seats when we saw these oscillations in our data – they showed us the spacecraft was in an entirely new region, comparable to what was expected in interstellar space, and totally different than in the solar bubble,” stated Don Gurnett, lead plasma wave science team member from the University of Iowa. With this new data in hand, scientists then went back into the Voyager 1 data archives from 2012 and were able to discern a similar set of oscillations from the October–November 2012 timeframe. Working backward, the science team determined that the oscillations in the plasma density field first appeared in late August 2012. The abrupt, durable change in the density of the energetic particles around Voyager 1 on 25 August 2012 was much more than the probe’s entrance into the magnetic superhighway. 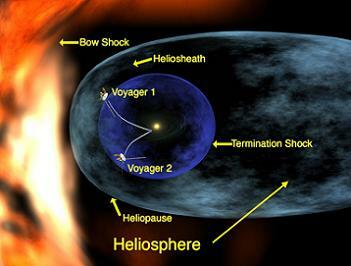 It was the date that Voyager 1 crossed the boundary into a space where no probe had gone before: interstellar space. “Voyager has boldly gone where no probe has gone before, marking one of the most significant technological achievements in the annals of the history of science, and adding a new chapter in human scientific dreams and endeavors,” said John Grunsfeld, NASA’s associate administrator for science in Washington. With this historic passage, Voyager 1’s mission in interstellar space stands to last at least 7 more years, as the probe has enough power to continue transmitting data regarding this unexplored region of space back to Earth until at least 2020. But equally as impressive as the uplifting and positive milestone we now understand Voyager 1 to have reached for humankind is the fact that the probe reached this mark with functioning scientific equipment – something no one truly envisioned happening in 1977 when Voyager 1 began what became its multifaceted mission that was only supposed to last through the probe’s encounter with Saturn in 1980. For the record, Voyager 1 traversed the distance of 121.6882 Astronomical Units (AUs) to the boundary to interstellar space in 34 years 11 months 20 days (5 September 1977 to 25 August 2012). Part II of NASASpaceflight.com’s 2013 Year in Review will be published on 27 December 2013 and will cover NASA and China’s lunar operations; NASA, ESA, and India’s Mars missions; and NASA’s Cassini spacecraft at Saturn. (Images via NASA, Paramount, JPL and L2).